•Take your personal style to the next level with Vibe's chic aluminum design and get ready to experience the ultimate in authentic inline stroller performance and adaptability for 1 or 2 children. •Easily navigate through tight shopping aisles with 3 wheel maneuverability. The front wheel is 12" of air filled glory, enabling you to get out and about and go just about anywhere! 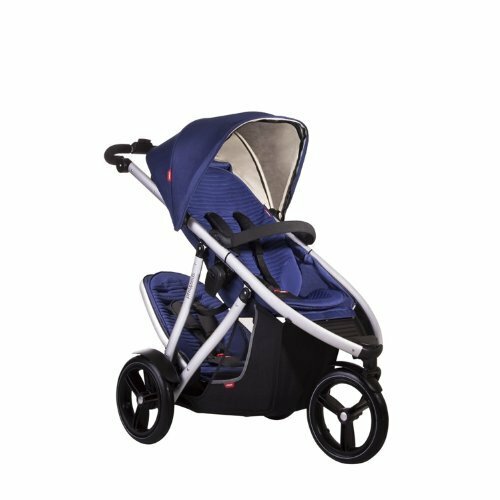 •Be intimate with baby while on the move, Vibes double kit becomes a parent facing seat by simply putting the stroller into lie flat mode and securing the top of the seat to the handle. •Children up to 41" or 6 years old comfortably fit into the newly enlarged seat. •Squeeze and go, touch to stop - the on handle brake makes for peace of mind and safe travels when you need to slow down, stop and remain stopped. Simple to engage, fast and safe.